All of us, yes I mean all of us use the toilet, very often several times a day ! 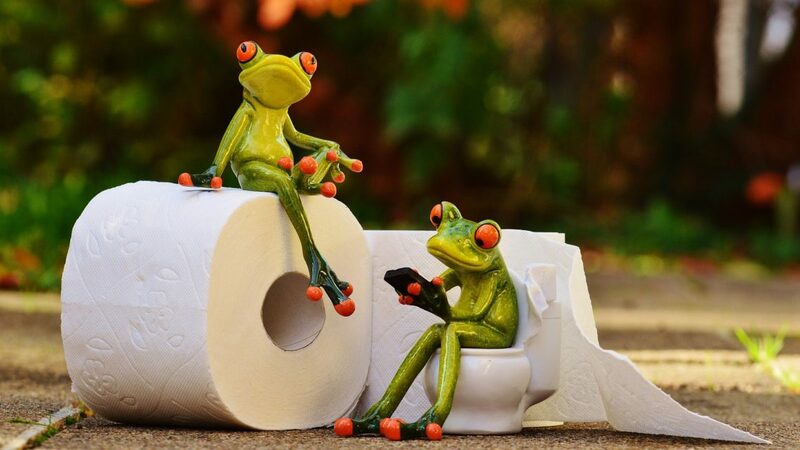 We never stop to question how easy we manage getting on and off the toilet – it’s something that just comes naturally. 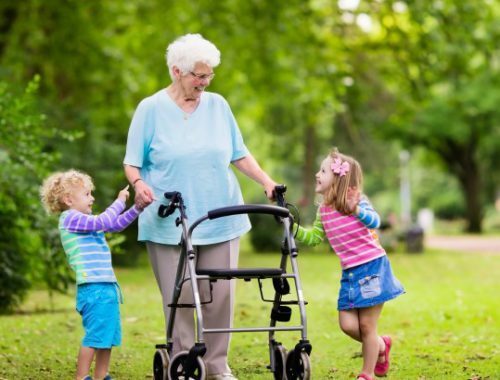 HOWEVER, for many elderly or less able-bodied person this normal everyday event can be a real struggle. Raised toilet seats for the elderly can easily be fitted and operated with almost all standard toilet designs. 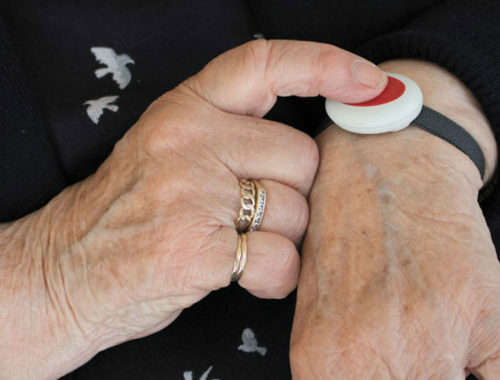 Whether at home, hospital or in a nursing or residential care home, they offer a solution to getting safely on and off the toilet. Some people have reduced strength in their limbs, weak core muscles (muscles that improve your balance and stability), general weakness or other health issues that make standing from a low height difficult. Ideally when sat your knees should be in line with your hips ( imagine your upper and lower body has a 90 degrees angle between it. More than 90 degrees will make it easier). If the seat is too low it makes transferring off the seat more difficult ( even with additional arm support ). There are normally three standard sizes ( 2″ / 4″ / 6″ heights ) to accommodate all users. The Ability Superstore padded raised toilet seat attaches to the existing toilet easily with four hook and loop strap connectors. The white vinyl cover can be easily cleaned and is a cheap affordable option for someone who wants a little more comfort as well as an extra 4″ height to make it easier getting on and off the toilet. An alternative might be the Homecraft padded raised toilet seat which is a very similar design and is available in either 5cm ( 2″ ) or 10cm ( 4″ ) cover depending on what you need. It is a little bit cheaper than the Ability Superstore padded seat but is just as good. The clip on toilet raiser is easy to fit securely on to the existing seat. The NRS Healthcare Novelle Portable Clip on raised toilet seat is a popular choice. 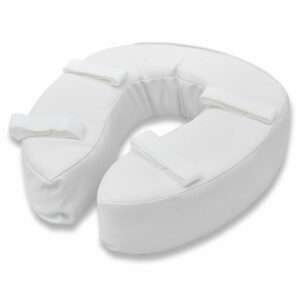 It features cut out sections at the front and back for personal cleaning and coccyx pressure relief, and it’s made from white plastic with smooth and rounded edges for complete comfort. The clip on seat is a similar price to the padded seat, but feels more supportive when you are sat on it. However, it very much depends on your own personal preference. Two adjustable fixing brackets lock onto toilet and make it easy to attach and remove while giving the user a stable sitting position. 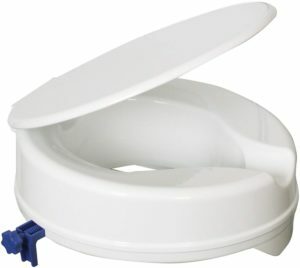 The lock on toilet raiser either comes on its own or with a attached lid so decide if you need your toilet covered, or not before purchasing. The Homecraft Ashby Easy Fit Raised Toilet Seat is a 10cm ( 4″ ) riser to your existing toilet, and has a maximum weight capacity of 190Kg ( 30 Stones ). The white plastic is easy to keep clean, and as antibacterial characteristics to prevent stains, bacteria, and odours from forming. 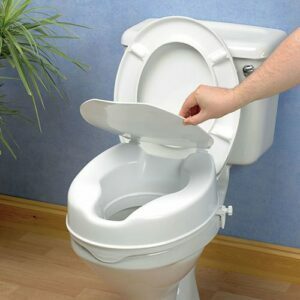 Many people do prefer to have a lid on their toilet seat, particularly if there are other members in the house who also use the toilet, from a hygiene point of view. 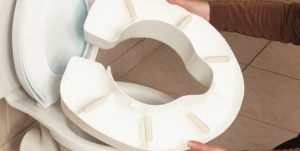 The Savanah Raised Toilet Seat is made of lightweight but durable white plastic, and has a gentle gradient from front to back, which makes transferring on and off the toilet that bit easier. 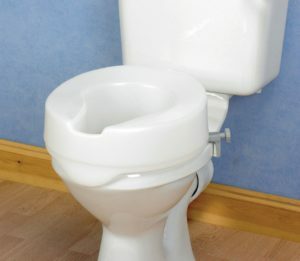 The seat is held in place by two L-shaped moulded plastic brackets with rubber, non-slip buffers, and when the toilet seat needs to be cleaned, it can be easily removed to allow easy access. Another option is the Aidapt 4″ Senator Raised Toilet Seat with Lid, which is designed to fit the majority of toilet bowl shapes. 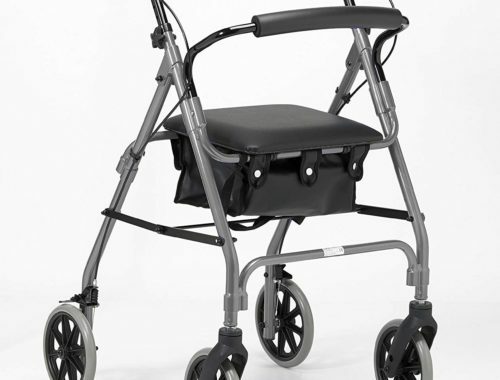 Made of lightweight plastic, it is easy to fit with side mounted brackets, and the front skirt has a rubberised pad for maximum stability and grip. With large front and rear cut-outs designed to aid personal cleaning, the seat is an affordable option for you. With so many products available it can be a bit daunting choosing the right one. So here’s a review of some of the best products around. From my own personal experience working as a physiotherapist in both hospital and community settings, the following raised toilet seats for the elderly offer a safe, affordable and practical solution. Width (with brackets) – 410mm (161/4″). Aperture – 270 x 210mm (101/2 x 81/4″). The Savanah has a large rear cut out making rear personal hygiene possible. If you are looking for an affordable lock on raiser with integral seat cover then the Savanah Raised Toilet Seat is a good choice. CLICK HERE to take a closer look. The additional arm support is a really important addition to this toilet raiser, and something that a lot of people benefit from having, to help them get safely on and off the toilet. CLICK HERE to take a closer look. Raised plastic seat with integral armrests designed to fit onto existing toilet bowl. Removable arms to aid side transfers and offer additional space when moving. Moulded heavy-duty plastic construction providing additional durability and strength. Durable and strong, the removable arms gives you more space when moving around, and also enable you to transfer safely on and off from the side if space is an issue. CLICK HERE to see for yourself. Ensure the seat comes with a locking system to keep toilet raiser in place. If other people in your house do not need a toilet raiser, an easy to attach and dismantle portable one is your best option. It can easily be stored away when other family members are around. Check your toilet shape. Some are standard sizes but there are also elongated versions. If unsure check the measurements prior to ordering. In my day to day work all three raisers discussed are useful aids to help you manage toilet transfers safely. However, I would recommend using the Mowbray Free Standing and Adjustable Toilet Seat. Yes it is slightly more expensive than the others, but it is lightweight, portable and both height and width adjustable to accommodate many different shapes and sizes. If you have any questions or need advice on choosing the correct raised toilet seat please contact me at mark@elderlyfallsprevention.com and I will be happy to help. Well done for tackling subject that’s not easy to talk about! No one wants to admit they need help using the toilet! Many of us do and it shouldn’t be a taboo topic! Yes it’s a problem that many people struggle with, and they aren’t always aware what equipment is available to them. All too often it ends up with someone falling. I am impressed with your writing style Mark. You presented the fact beautifully. I will share this article with my friend as her father need it. I will tell her about your recommendation too. Thanks for the post Mark. Thanks Sarah, I appreciate your comments. oh wow! my mom is really sick with an autoimmune disease, and i wouldn’t consider her old, but this would really help. its mostly hard for her to get off the toilet because of it being so low. im glad to see that there are so many options… ill most definitely be showing her this post to see if she want to try any of them out. Thanks Laila, please feel free to contact me if she wants advice on a particular product and I’ll be glad to help. Thank you so much for this article! This is great information that I will have to show my father. Both of his knees need to be replaced and he has been putting off an operation, so standing back up is something of a challenge for him now. Thank you for sharing your thoughts! Thanks Christopher, I’m really pleased that the information was of benefit for your father. Please contact me should you require any further advice or support. This is a really good website, it is very organized the links opens in a new window which is good it is very easy to navigate around the site. Very well put together. Thanks for the feedback Darryl, I appreciate your comments.